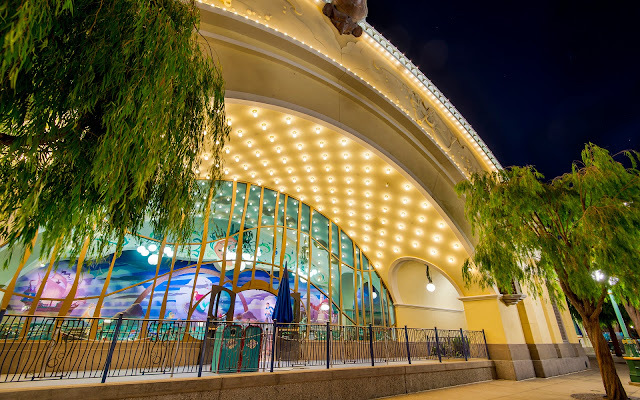 Back when The Little Mermaid attraction opened at Disney California Adventure in 2011, I tried taking some of those empty night photos that I feature so commonly now on this blog. My night photography wasn't quite as advanced back then, though, and I was never able to get a really balanced, smooth, and crisp shot. 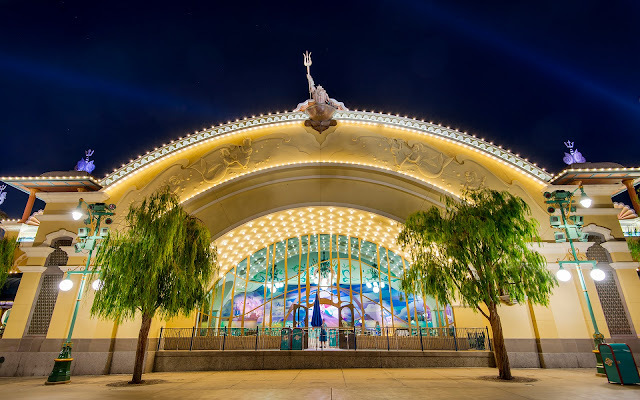 Fortunately, I've picked up a few tricks and bits of knowledge since then, so a few months ago, I decided to go back and shoot the facade late at night, near closing. These turned out a little bit better, and though you can't see my original attempts for comparison, you'll just have to trust me on the assessment on differences! The Little Mermaid attraction at DCA features an elegant Victorian-inspired facade. The individual bulbs recall the aesthetic of Victorian seaside amusement parks of past centuries.